SB616 is a result of the sunset commission report. It impacts Texas Occupations Code 1702 (Texas Private Security Act) in 3 critical areas as previously cited by the TBFAA to the sunset commission. Earlier this week we asked you to contact your legislators and your efforts have paid off. On Wednesday morning, TBFAA President Kelly Ryan met with several senators who are on the committee and your contacts paved the way for further discussion. All of the Senators were aware of the issues because of your contacts. Wednesday afternoon at the hearing several senators indicated that they will be introducing amendments to address out concerns. We are continuing to work on this issue before the committee vote next week with our lobbyists at McWilliams Governmental Affairs Consultants. Click here to view the video of the hearing. It is a long hearing here are some highlights if you want to skip ahead. At 2.09.28 President Ryan testified followed by questions. Here is a summary of the hearing provided by McWilliams Governmental Affairs Consultants. Sen. Birdwell said the bill streamlines and simplifies private security regulation by DPS in several ways. First, he said, it reconstitutes the Private Security Board as an advisory committee to DPS and clarifies that all private security regulation is solely within the purview of the Public Safety Commission and DPS. He said it consolidates the licensure of seven categories of persons who are not directly providing private security services, including managers, partners, branch officers, and other people under the same company. He said it changes law so that an individual providing private security services will get a license rather than a registration or endorsement. He said the bill discontinues the licensing of security alarm salespersons, private security consultants, telematics specialists, and guard dog companies. He said it gets rid of duplicate pay out provisions. He said it standardizes DPS administration of regulatory programs and gives DPS a full range of enforcement sanctions. Chair Campbell asked about the provision in the bill that would turn the Private Security Board into an advisory committee and asked Sen. Birdwell to talk about that more specifically because she has heard a lot of concern about it. Sen. Birdwell said there were a number of things in the private security industry where entities were being licensed and other regulatory activity being applied to people who were not within the “inner circle” of the immediate order of having an effect on private security actions. He said this bill therefore deregulates 7 private security a licenses and registrations, specifically for partners in ownership, shareholders, corporate officers, managers, supervisors, and branch officers. He said that way, the amount of licensing that DPS is having to do will not include entities that are not directly in the zone of action. He said the current regulation of these people is a waste of time and efficiency. Sen. Campbell said she had been hearing so much concern about this and could figure out why there was concern about this bill doing that. Sen. Campbell said later they would be offering up a few committee amendments and pulling them down, and would also do so at next week’s Committee hearing before the bill is voted on. Sen. Birdwell said he appreciated that the Committee was approaching it that way so that those issues can be talked about on the Senate floor. 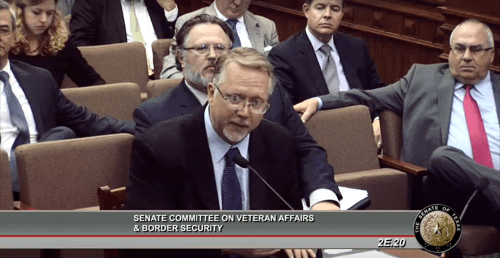 Steven Mach, Chairman of the Texas Public Safety Commission said DPS is tasked with regulation of private security and other issues, and they can pursue enforcement actions before the State Office of Administrative Hearings (SOAH). He said language in this bill would require DPS to issue final orders itself, which would add over 135 more regulatory hearings annually to the Commission agenda which would hinder its effectiveness. Sen. Campbell said they will take up and consider various committee amendments next week before the bill is voted on just so that the issue will be eligible to be discussed on the Senate floor. Kelly Ryan of the Texas Burglar and Fire Alarm Association (TBFAA) testified neutrally on the bill. He stated that for salesmen in the alarm and security industries, he thinks citizens deserve to know those salespeople have been background checked and fully vetted. He said removing the registration requirement takes away doing the background check and the requirement for companies to provide continuing education for these salespeople. He said right now, salespeople for alarm companies have to take a 16 hour course in their first two years of employment, and have to take additional continuing education every two years following. He said removing the endorsement takes away DPS’ ability to enforce its rules on salespeople. Mr. Ryan next discussed qualified managers, noting that they are the point person for their company’s interactions with the State of Texas. He said this helps DPS be more efficient in its audits and investigations. Mr. Ryan said the Private Security Board is there to take on the work load from DPS, and noted the discussion above about how the Public Safety Commission already has a lot of hearings on its plate. In that regard, he asked, why would they want to shift the Private Security Board’s hearings onto the Commission’s plate. He urged the Legislature to leave it with the Private Security Board and let them continue to handle the work. He said there is a buffer there to make sure the statutes and DPS rules are taken into consideration by the Private Security Board. Sen. Menendez asked if Mr. Ryan was saying that the committee substitute takes away the requirement for background checks on people who sell and install home alarms. Mr. Ryan said yes. Sen. Menendez said he doesn’t know why they would make that policy decision in a Sunset bill. Mr. Ryan said TBFAA knows there is a push for more deregulation and they get it, but it needs to be done the right way, and taking away regulation of salespeople is not the right way. Sen. Menendez said these are people who are installing security in people’s homes or work places, and not doing background checks on them makes no sense to him. Sen. Johnson asked if this applies to not just home burglar alarms but fire alarms also. Mr. Ryan explained that fire alarms are regulated by the Texas Department of Insurance (TDI), and that DPS deals solely with home security. He noted that DPS’ oversight of home security and alarm systems also includes surveillance systems. Sen. Johnson asked about qualified managers and how that relates to DPS’ ability to oversee these systems. Mr. Ryan explained that every licensed company has to have a qualified manager. He said that is a state term and doe not necessarily mean the manager of the facility. He said qualified manager is the state’s term for the point of contact between the state and a licensed company. He said when the state conducts an annual audit of every licensed company, the contact is the qualified manager. He said if the qualified manager is removed as the point of contact, it could create chaos for auditors. Sen. Johnson asked if this would increase the workload for DPS and reduce their ability to work well. Mr. Ryan said yes, added that the same is true on the DPS enforcement side, because the qualified manager is also the DPS point of contact when they do an investigation. Sen. Johnson asked about the removal of the Private Security Board’s authority and said his understanding is that the Board members currently are appointed by the Governor with rulemaking authority. He said this bill would strip their authority and give it to DPS. He said his understanding is currently the standards for licensing in the industry are determined by the Private Security Board, similar to how it is done in this state for the fields of medicine and law. He aske if moving that function fully to DPS was concerning. Mr. Ryan said yes, as it will increase the workload for the Public Safety Commission in asking them to do what the Private Security Board is doing now. He said the Private Security Board does not have authority to do anything that is inconsistent with state law on security regulations. Sen. Johnson asked if the Board has to operate within the confines of existing law. Mr. Ryan said yes, the Board has to follow Occupations Code Chapter 1702 and the Administrative Code. Sen. Johnson asked if these people are consultants as well as salespeople. Mr. Ryan said technically consultants fall under a different license, and if they are consolidated correctly, they should put a consultant in the same category as a security salesperson. Sen. Johnson noted that this bill moved from registration and licensing to just pure licensing with no registration, and asked what it means to be registered in addition to licensed. Mr. Ryan explained that every company holds a license. If you remove that, he said, now all alarm installers are required to hold a license, so you could see a shift in liability away from the company and onto the installer. He said this would require the installer to carry independent insurance, which most could not afford. He said if an entity is registered, they have their own set of contracts and insurance. Sen. Johnson said it seems that registration also gives DPS additional ability to track activities. Sen. Menendez said he was unsure whether he had to disclose any potential committee amendments now or if he could do it at next week’s Committee meeting. Chair Campbell said it would be proper to inform the Committee now and then bring the amendments forward next week. Sen. Menendez said he is going to be taking a look at the possibility of bringing forward a committee amendment on this, because eliminating the background check makes him uncomfortable. Chair Campbell said she thinks that is great, because they are talking about security officers or people selling alarm systems, so they have a public safety risk if the Legislature doesn’t get it right. She said she thinks these are good points that give cause for concern, and she looks forward to considering these amendments. She said they need to look at keeping background checks with all that is going on in this crazy world. She noted that President Ronald Reagan said “trust, but verify,” and that is what background checks do. Sen. Johnson said he also would be bringing forth amendments concerning licensing and registration, ownership, and the Private Security Board’s authority. He said he will briefly discuss these amendments at the next Committee meeting so they too will be eligible for consideration on the Senate floor.